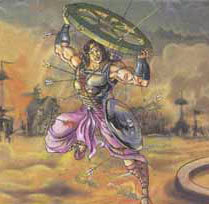 Abhimanyu was the son of Arjuna and Subhadra. He was very skilled at archery and was the pride of the Pandavas. Even as a lad, Abhimanyu was very brave and strong. Once, while Abhimanyu was in his mother's womb before he was born, he heard Arjuna telling Subhadra how to tackle warriors when they surround you in a chakravyuh or maze during a battle. Arjuna explained to Subhadra how to enter a chakravyuh, but he was called away before he could explain the way to get out of it. Consequently, Abhimanyuwas born with the knowledge of how to enter a chakravyuh, without knowing how to get out of it. when he grew up, he was married up Uttara, the daughter of king Virata.